A remotely conducted empirical psychological assessment of Russian leader Vladimir Putin is currently in progress, using the third edition of the Millon Inventory of Diagnostic Criteria (MIDC), which yields 34 normal and maladaptive personality classifications congruent with DSM–IV. Informal observation suggests that Putin is a highly dominant leader. However, more systematic observation is required to establish whether he is an introvert or an extravert. Etheredge’s high-dominance introvert is similar in character to Margaret Hermann’s (1987) expansionist orientation to foreign affairs. These leaders have a view of the world as being “divided into ‘us’ and ‘them,’ ” based on a belief system in which conflict is viewed as inherent in the international system. This world view prompts a personal political style characterized by a “wariness of others’ motives” and a directive, controlling interpersonal orientation, resulting in a foreign policy “focused on issues of security and status,” favoring “low-commitment actions” and espousing “short-term, immediate change in the international arena.” Expansionist leaders “are not averse to using the ‘enemy’ as a scapegoat” and their rhetoric often may be “hostile in tone” (pp. 168–169). From the perspective of Hermann’s (1987) sixfold typology, the best fit for the high-dominance extravert is the active-independent orientation to foreign affairs. These leaders, though recognizing the importance of other countries, are self-reliant and prefer to participate in international affairs on their own terms and without engendering a dependent relationship with other countries (p. 168). 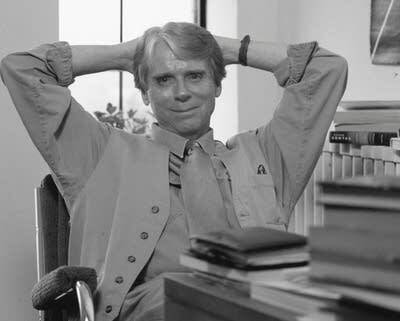 In terms of personal political style, they “[s]eek a variety of information before making a decision; examine carefully the possible consequences of alternatives under consideration for dealing with a problem; [and] cultivate relationships with a diverse group of nations” (Hermann, 1987, p. 169). The foreign policy resulting from an active-independent orientation is generally “focused on economic and security issues.” These leaders’ behaviors are “usually positive in tone but involves little commitment” because they “shun commitments that limit maneuverability and … independence” (Hermann, 1987, p. 169). In summary, preliminary findings [confirmed 7/30/2014] suggest that Putin is more of an expansionist than an active-independent leader. Etheredge, L. S. (1978). Personality effects on American foreign policy, 1898–1968: A test of interpersonal generalization theory. American Political Science Review, 72, 434–451. Hermann, M. G. (1987). Assessing the foreign policy role orientations of sub-Saharan African leaders. In S. G. Walker (Ed. ), Role theory and foreign policy analysis (pp. 161–198). Durham, NC: Duke University Press. Following additional data collection by summer research fellow Joe Trenzeluk during the months of June and July, the psychological assessment of Russian leader Vladimir Putin has been completed. The next phase of the study, to be conducted during the month of August, will be to elaborate on Putin’s leadership style, employing his personality profile as a temporally and cross-situationally stable framework for anticipating his future political behavior. 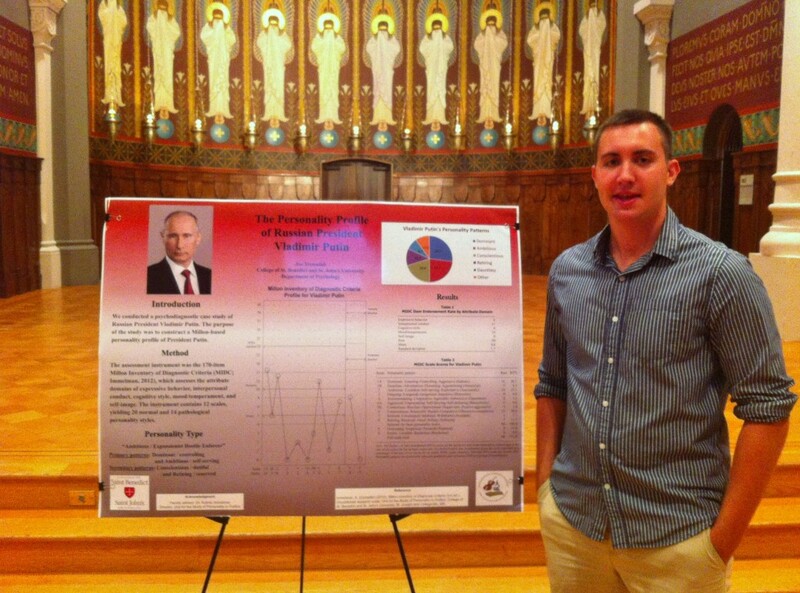 Joe Trenzeluk presents his research on “The personality profile of Russian president Vladimir Putin” at the Undergraduate Research Poster Session, Great Hall, St. John’s University, Collegeville, Minn., Aug. 6, 2014. This paper presents the results of an indirect assessment of the personality of Vladimir Putin, president of the Russian Federation, from the conceptual perspective of personologist Theodore Millon. 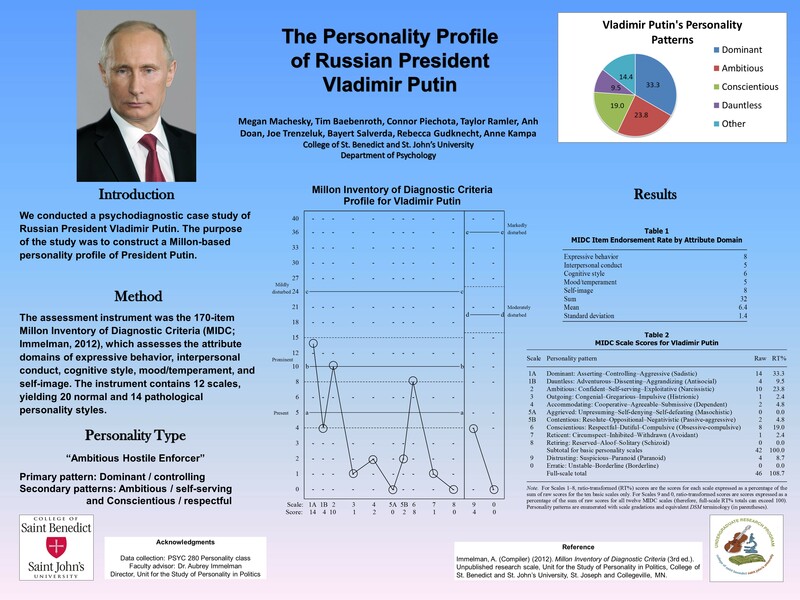 Psychodiagnostically relevant data regarding President Putin was extracted from open-source intelligence and synthesized into a personality profile using the Millon Inventory of Diagnostic Criteria (MIDC), which yields 34 normal and maladaptive personality classifications congruent with Axis II of DSM–IV. The personality profile yielded by the MIDC was analyzed on the basis of interpretive guidelines provided in the MIDC and Millon Index of Personality Styles manuals. Putin’s primary personality patterns were found to be Dominant/controlling (a measure of aggression or hostility), Ambitious/self-serving (a measure of narcissism), and Conscientious/dutiful, with secondary Retiring/reserved (introverted) and Dauntless/adventurous (risk-taking) tendencies and lesser Distrusting/suspicious features. The blend of primary patterns in Putin’s profile constitutes a composite personality type aptly described as an expansionist hostile enforcer. Dominant individuals enjoy the power to direct others and to evoke obedience and respect; they are tough and unsentimental and often make effective leaders. This personality pattern defines the “hostile” component of Putin’s personality composite. Ambitious individuals are bold, competitive, and self-assured; they easily assume leadership roles, expect others to recognize their special qualities, and often act as though entitled. This personality pattern delineates the “expansionist” component of Putin’s personality composite. Conscientious individuals are dutiful and diligent, with a strong work ethic and careful attention to detail; they are adept at crafting public policy but often lack the retail political skills required to consummate their policy objectives and are more technocratic than visionary. This personality pattern fashions the “enforcer” component of Putin’s personality composite. Retiring (introverted) individuals tend not to develop strong ties to others, are somewhat deficient in the ability to recognize the needs or feelings of others, and may lack spontaneity and interpersonal vitality. Dauntless individuals are adventurous, individualistic, daring personalities resistant to deterrence and inclined to take calculated risks. Putin’s major personality-based strengths in a political role are his commanding demeanor and confident assertiveness. His major personality-based shortcomings are his uncompromising intransigence, lack of empathy and congeniality, and cognitive inflexibility. The past few months have sparked heated debate regarding President Obama’s handling of foreign policy, specifically the crisis in Ukraine and his negotiations, or lack thereof, with Vladimir Putin. Critics have accused Obama of appearing weak and passive, imposing feeble sanctions and essentially letting Putin’s expansionism go unchecked. From their perspective, Obama is not a president who adversaries fear, but a mere annoyance who the tough, Judo-champion, ex-KGB Russian president easily can swat aside. This mismatch between the world’s two most powerful men (according to Forbes’ latest rankings) should come as no surprise. 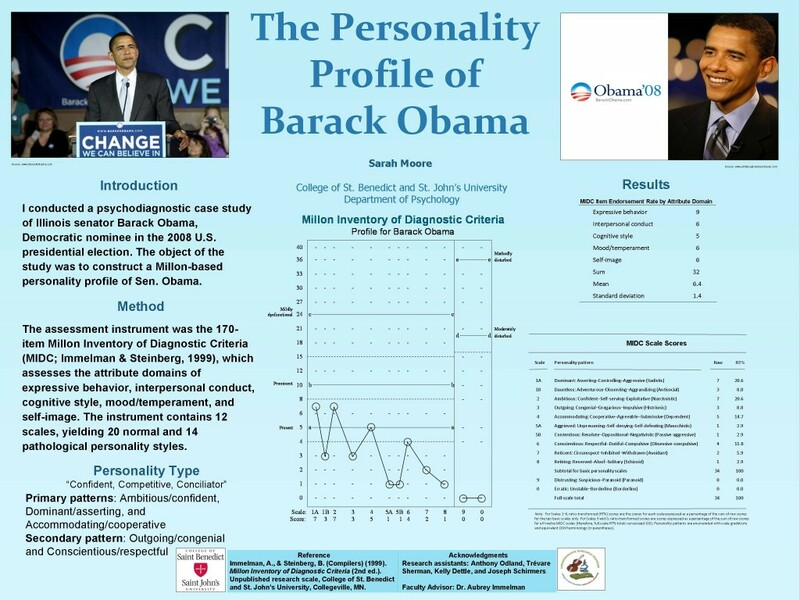 Studies of Obama’s personality conducted at the Unit for the Study of Personality in Politics show that, not unlike Putin and many other world leaders, Obama is an ambitious individual. However, the key difference between the personalities of Obama and Putin is an accommodating tendency on Obama’s part, in stark contrast to Putin’s strongly dominant personality pattern. Accommodating leaders like Obama have a strong preference for negotiation over force. Although this predisposition can be a net positive under some situations, when dealing with hard-nosed individuals such as Putin, it can spell trouble. 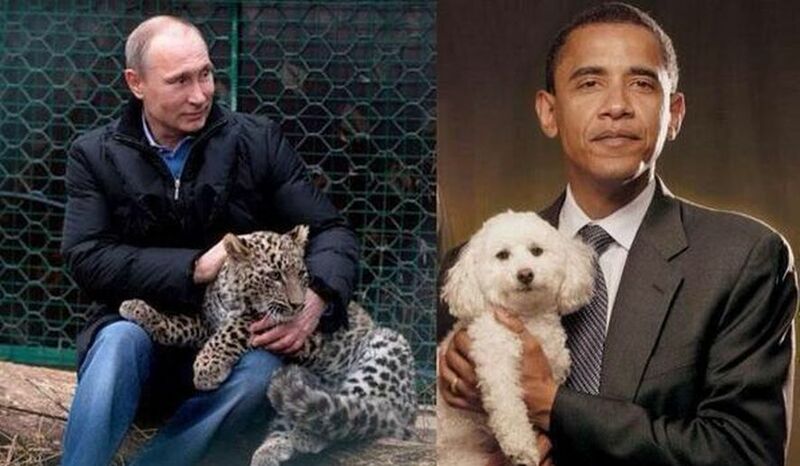 The ambitious, controlling, opportunistic Putin is sure to take advantage of Obama’s accommodating nature. Political-psychological studies suggest that putative 2016 presidential candidate Hillary Rodham Clinton may be better suited than Obama to deal with Putin. Comparing Clinton and Obama head-to-head, it is evident both are highly ambitious. However, where Obama is accommodating, Clinton is highly dominant. The political implication of this personality difference is that Clinton would likely deal with Putin from a position of strength and articulate her position bluntly and with clarity, while refusing to let Putin outmaneuver her. Granted, one could argue Clinton’s personal style — specifically her tendency to be assertively uncompromising — would run the risk of adding fuel to the fire, escalating the standoff with Russia over its annexation of Crimea. In reality, however, Clinton’s psychological profile underscores that she is a dutiful individual who would exercise due diligence in dealing with Putin and proceed prudently when playing hardball politics. Putin, whose personality profile reveals a thin-skinned person who handles criticism poorly and becomes defensive, would be thrown off balance by the direct confrontation on which Clinton thrives. Significant personality contrasts between Obama and Clinton offer insight into the political implications of their respective personal political styles. The politics of conciliation characteristic of Obama will likely wane in the next administration. Having been accustomed to the relative ease of dealing with the more conflict-averse Obama for the better part of a decade, Putin will be in for a rude awakening if Clinton is to hold the reins of power in the post-Obama era. This is the opinion of Joe Trenzeluk, Inver Grove Heights, a junior psychology major at the College of St. Benedict and St. John’s University, where he is a summer research fellow in the Unit for the Study of Personality in Politics, directed by Aubrey Immelman. On July 17, 298 innocent victims were killed when Malaysia Airlines Flight MH17 was shot down over Ukraine. As attempts to investigate the incident continue, international pressure has been placed on Russian President Vladimir Putin because it is believed the Russian military supplied Ukrainian pro-Russia separatists with the Buk surface-to-air missiles that downed the airliner. Putin issued a statement that Russia will do “everything in its power” to assist with the investigation and offered his condolences to people who lost loved ones in the tragedy. If Putin’s role in the current crisis in Ukraine, his relations with the Syrian regime and pro-Assad Iran, and ongoing reports of human rights violations in Russia are not enough to call into question Putin’s character and leadership qualities, the downing of Flight MH17 certainly has. 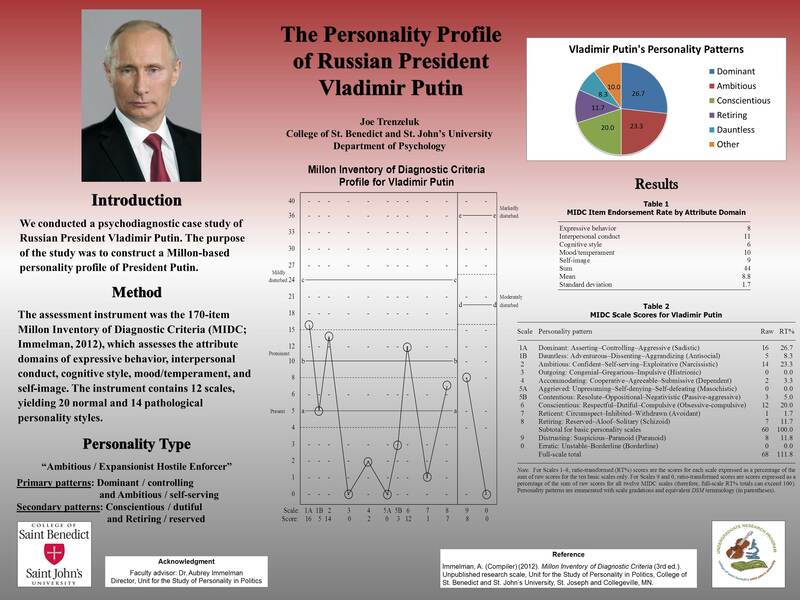 Empirical analysis of Putin’s personality at the College of St. Benedict and St. John’s University’s Unit for the Study of Personality in Politics reveals that Putin is a highly dominant, narcissistic leader with secondary features of high conscientiousness and substantial introversion. Identifying the personality configuration of political leaders matters because personality points to stable, enduring patterns in a person’s motives, thoughts, and actions over time and across situations. Thus, accurate personality assessment allows us to anticipate a leader’s response to a broad range of contingencies. In terms of foreign policy role orientation, the “high-dominance introvert” facet of Putin’s personality parallels what political psychologist Margaret Hermann has labeled an expansionist leader. Expansionists, like Adolf Hitler or Saddam Hussein, see the world as being “divided into ‘us’ and ‘them,’ ” based on a belief system in which conflict is viewed as inherent in the international system. Other common characteristics of expansionists include a high degree of power motivation, strong nationalism, an unwavering belief in one’s ability to control events, supreme self-confidence, distrust of others, and a very goal-directed level of task orientation — all of which are evident to varying degrees in Putin’s personality profile. Putin believes the world is divided between his Russia and the West, often using “the West” or “democracy” as a scapegoat for his problems. Rising through the KGB and Russia’s political elite, he entwined himself with the history of Russia. Typical of narcissistic leaders with exalted self-concept and dreams of glory, he views his destiny and that of the Russian state as one and the same. Putin is Russia; Russia is Putin. Although Putin shows no discernible signs of contemplating genocide or waging conventional war — sensation-seeking adventurousness ranks relatively low in his overall personality profile — he displays a desire for control and deeply entrenched feelings of resentment toward the West. His world is a zero-sum game in which any gains by the West or by domestic opponents are considered moral threats to his power. Minnesota’s preeminent Russia expert, Nick Hayes [link added], gives a complex portrayal of Vladimir Putin, a man who sees himself as the leader who has given Russia a place at the table for international diplomacy. Hayes is professor of history and holds the university chair in critical thinking [link added] at St. John’s University and the College of St. Benedict [link added]. He spoke May 6, 2016 at the Selim Center at the University of St. Thomas. Michael Hemesath discussed Russia’s economic past and future, and said Russia has “wasted” twenty years. Russia is “an important big middle income ecoonomy, but I don’t see them being a world power going forward, and their ‘playing footsie’ with China isn’t going to change that,” he said. Nick Hayes is University Chair of Critical Thinking at St. John’s University and is writing a book about his many visits to Russia and how it has changed over the years. Michael Hemesath is president of St. John’s University. A Harvard-trained economist, he has directed study-abroad programs in Russia and Ukraine. Gary Eichten moderated the event held March 26, 2018 at the Museum of Russian Art in Minneapolis. He was a longtime host at Minnesota Public Radio and retired in 2012. 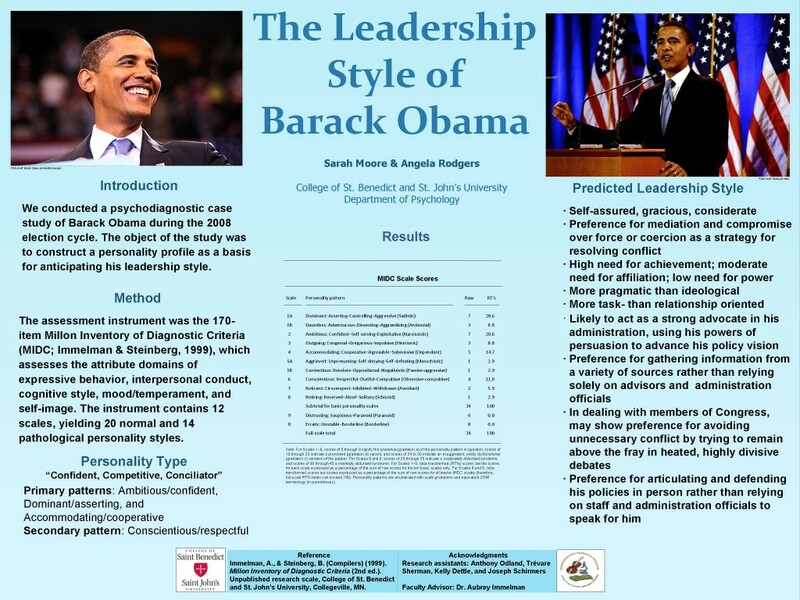 A psychological profile of U.S. President Barack Obama, developed at the Unit for the Study of Personality in Politics during Obama’s 2008 and 2012 presidential campaigns, reveals that the president is a highly confident, moderately accommodating and deliberative, somewhat reserved personality type best described as a confident conciliator. As shown in the pie chart above, Obama is primarily an Ambitious/confident personality, complemented by secondary Accommodating/cooperative, Conscientious/respectful, and Retiring/reserved features. Excerpt: Fiona Hill, the incoming senior director for Russia and Europe on President Trump’s National Security Council staff, is the co-author of “Mr. Putin: Operative in the Kremlin,” essentially a 500-page psychological profile of the Russian leader, from his early KGB years through his rise and rule at the Kremlin. … First published in 2013 and updated in 2015, the book breaks down Putin’s overlapping personas, showing how they shape his dominance at home and rivalries abroad. 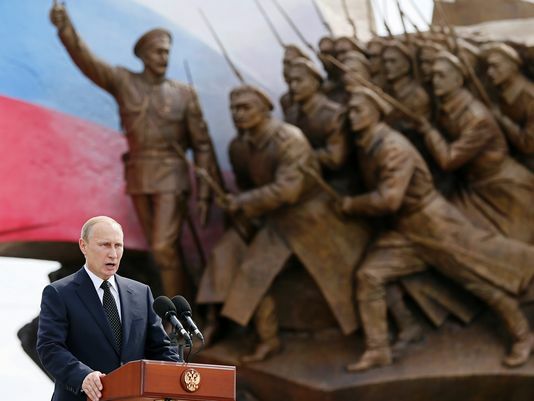 Hill and co-author Clifford G. Gaddy of the Brookings Institution list six identities that they think make up Putin’s “mental outlook, his worldview” — the Statist, the History Man, the Survivalist, the Outsider, the Free Marketeer and the Case Officer.